MIUI 9 China Beta ROM for Redmi Pro is now available for download. The new MIUI 9 features include Image Search, Smart Assistant, Smart App Launcher, and Performance Enhancements. MIUI 9 Update for Redmi Pro is out, and you can download it right now. 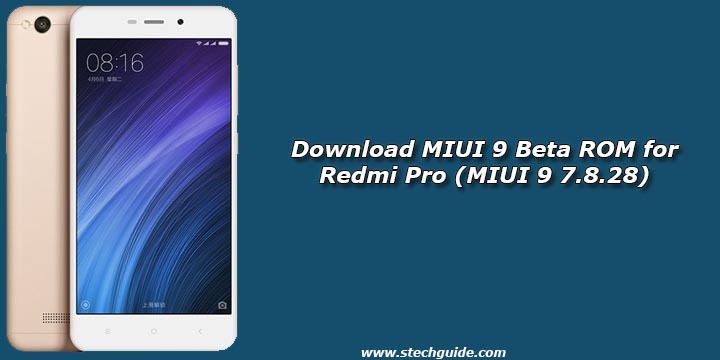 Follow the below guide to Download MIUI 9 Beta ROM for Redmi Pro and Update Redmi Pro to MIUI 9 manually. Redmi Note 4X and Mi 6 already received the MIUI 9 Global Beta ROM and MIUI 9 Global ROM for Redmi Pro will be available soon but for now, you can download MIUI 9 China Beta for Redmi Pro. If you want to Update Redmi Pro to MIUI 9 then Download MIUI 9 Beta ROM for Redmi Pro from below. Check out Complete List of MIUI Features, Compatible devices, and Release Date. The future MIUI 9 update will be rolling out via OTA but for now, you have to Download MIUI 9 Beta ROM for Redmi Pro from below and flash it manually. These MIUI 9 ROM for Redmi Pro are for the Chinese ROM and includes Chinese bloatware also Google applications in this build are not included, but you can later Install it manually. Download Nougat Based MIUI 9 Beta ROM for Redmi Pro from below. To install MIUI 9 update for Redmi Pro download either Recovery ROM or Fastboot ROM from above and use the below method to install this on your device. Now change the Language or Region of your country (For Example- you see “it” or “IT” it’s for Italy). Where you see “scorpio_mam_global” (Mi Note 2), change it with your device code [Ex – Mi 5 (gemini), Redmi 4x (santoni), etc.]. After that reboot your device to Globalize China ROM. Now all the chinese content from system apps like music, browser, etc. will completely remove. The post Download MIUI 9 Beta ROM for Redmi Pro (MIUI 9 7.8.28) appeared first on Android News.